Street art is a colourful, intriguing form of creativity, which employs any number of techniques in its creation. One of the newest and possibly strangest forms of this art is yarn bombing – so what is this interestingly titled street art? Yarn bombing involves the creation of yarn items that cover public objects in full view of the public. The artist creates a cover from yarn for an object from the likes of Noro yarn, or Rico Can Can, which is then placed over the street object. It’s also known as yarn storming, guerrilla knitting, or graffiti knitting and has become increasingly common in the last couple of years across the UK. 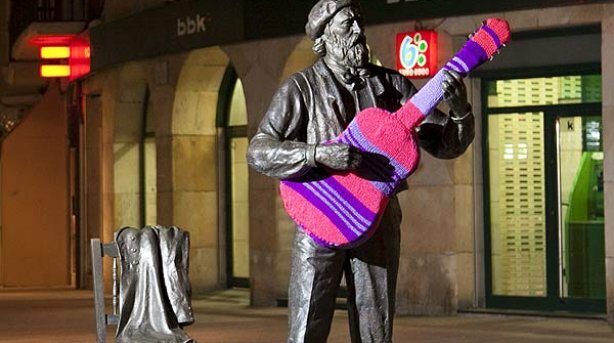 Initially, yarn bombing began as early as May 2004 in the Netherlands, where it’s first known practice was in Den Helder. It appears to have spread to the USA around one year later where it was used in Texas. Knitters in the Lone Star State began to knit yarn bombs from different pieces of unfinished knitting projects they’d taken up, but failed to finish. Origingally, lady called Magda Sayeg from Houston is said to have begun the idea of covering her boutique door handle with a custom-made cosy. From here the idea spread worldwide and can be seen in every major city worldwide at some stage or another. There is now even an International Yarnbombing Day, held on the 11 June. The idea of yarnbombing is also said to have changed young people’s perception of knitting, and those involved are not seen as criminals. Unlike with graffiti art, where artists are seen as criminals, yarnbombers are considered to be fibre artists who use the likes of noro yarn and rico can can – far from something associated with vandalism. Yarnbombing, which involves the crocheting of cloth, more often than not covers bike racks, light poles, telephone boxes and otherwise drab and abandoned objects, often in industrial areas. One of the most major parts of yarnbombing is the knitters hope that people will stop, having seen something interesting, and take a fresh look at the everyday surroundings, which will be covered with Rowan Yarn, or Sirdar Indie yarn. This is partially down to the fact that yarn bombs can be easily and quickly removed when needs be. Furthermore, though they often last for a number of years they are non permanent. The act of yarnbombing is technically illegal, but is overlooked on a far more common occasion than graffiti, or other forms of street art because of the aforementioned perceptions. One of the reasons for the tolerance with yarn bombing is also because it doesn’t have any sort of decisive political message. Yarnbombing focuses on reclaiming and brightening up industrialised and down beaten areas, by trying to make the sterile more personal and a bit brighter. There have been certain knitters worldwide who have come up with agendas for what they feel they should do, with their knitting in a similar way to other street artists. Knitta Please and Knit the City are two of the most prominent groups of Yarnbombers, though there are a number of smaller artists who tag across a range of cities. Pack Lane Wool is a supplier of quality yarns and wool, as well as accessories for knitting enthuiasts and crafters.